The Persephone period is over. Elliot Coleman in his Winter Harvest Handbook, coined this name. When daylight hours are less than 10 hours per day, the plants that are in the ground slow down or stop growing altogether during this time. This means that the spinach or mache you planted last fall had slowed down and by Thanksgiving stopped growing. The Persephone period can be longer or shorter depending on what latitude you live in. 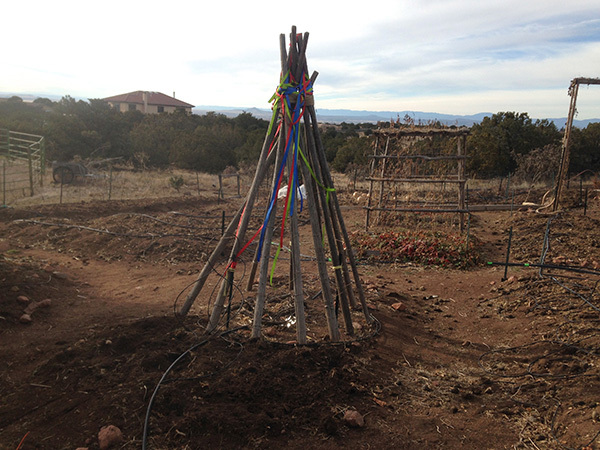 For us in Santa Fe, it is from Thanksgiving to Jan 14th. In states that are further north, they are still in the Persephone period. As the daylight hours continue to get longer and longer, you should notice the plants starting to grow again. I grew ‘Carmel’ spinach last fall in one of my beds up by my house and it is still alive, covered with winter weight row cover. I did this the year before and it survived and gave me beautiful spinach by March that I was able to harvest 4 times before it became too warm. 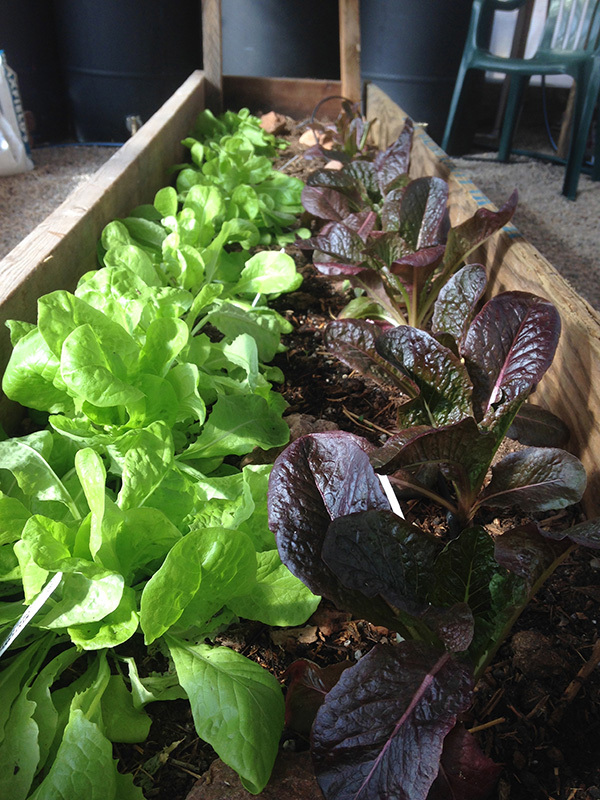 If you didn’t grow anything to overwinter, you can now start spinach, Asian greens like ‘Tatsoi‘ and ‘Baby Bok Choy’, mache and some very cold hardy lettuces like ‘Winter Wunder’ and ‘Marshall Red Romaine’ once the soil warms to 40•F+. If you keep them covered with winter weight row cover to protect them from our cold nights, you will be able harvest them in early spring barring any devastating deep freezes. If you can’t wait and want to speed up the process, start the seeds under lights inside now and transplant them next month in February. To find other extra cold hardy crops to grow, go here. 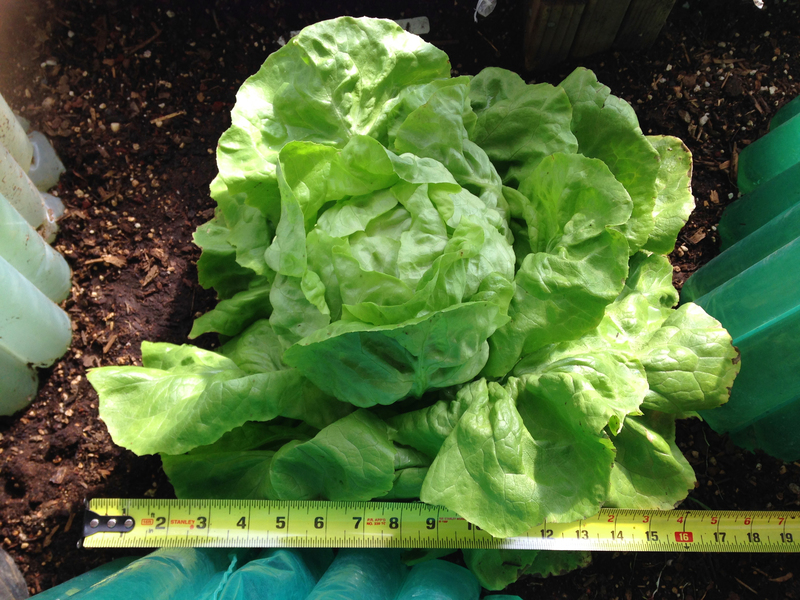 This year, one of the lettuces I grew is called Santoro, a type of butterhead lettuce that is heat-resistant, cold resistant, has a wonderful taste and grows really big if given the chance. I got the seeds from Cooks Garden seed catalog. I started them inside the house on Jan 29, transplanted them into 2″ pots on Feb 14 and transplanted them again into the greenhouse in mid April. 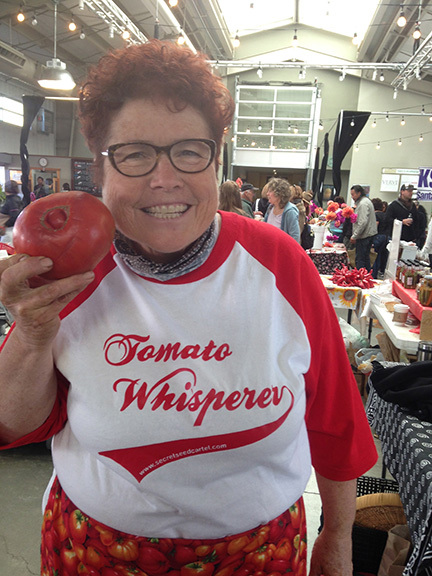 I read somewhere Santoro lettuce can produce 12″ heads if you give them the room. So I spaced them really far apart to see if they could get that big. 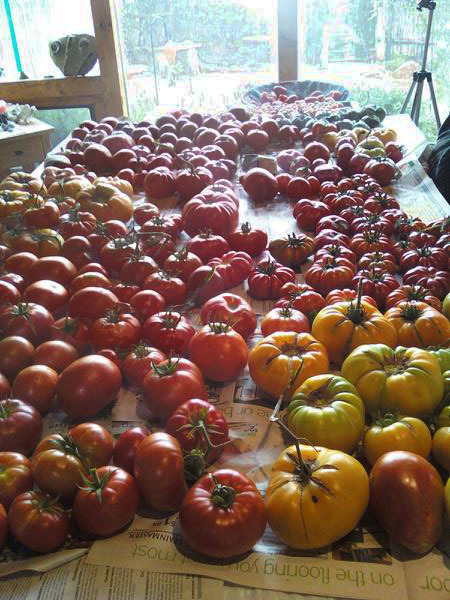 They say if you crowd big varieties they will never reach their maximum size. In the picture above I’ve picked the outer leaves to eat and wanted to see if they would grow back. The heads on the right haven’t been touched yet. As you can see I picked pretty hard. They grew back almost to the same size as the ones that weren’t picked. A couple of weeks later-Check out the size of these heads-a full 12 inches across. They are still growing in the greenhouse but now I’m picking the whole head (instead of just the outer leaves) as I had to make way for the tomatoes that will grow in there. In fact I already have all 18 tomato plants (in wall of waters) inside the greenhouse as of May 13. I know it will get too hot for lettuces inside the greenhouse this summer so I’m starting to pull them to eat. May 31-I just picked this last head of Santoro lettuce yesterday (shown above between the tomatoes in the wall of waters) and it hadn’t bolted yet even though the temperatures in the greenhouse have gotten over 80 degrees. It’s handled 19 degrees to over 80 degrees! It reached 17 inches across! Hasn’t gotten bitter and is still soft and wonderful to eat. I’ve never had such great lettuce as this year, not only with this lettuce but with all of them in the greenhouse. Seems I’ve figured out how to be successful with them. 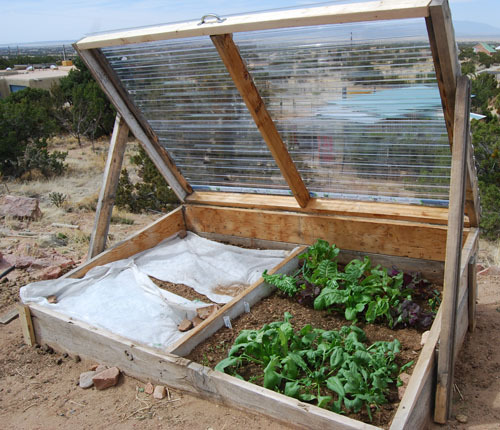 I’ve done a lot of research on them from Nov-Dec to find some great varieties that were cold tolerant and now I’ve researched out what varieties of lettuce are heat tolerant, hoping to grow them in the shade this summer here in Santa Fe without bolting. Most of us don’t even try to grow lettuce in the summer as it is pretty warm here. I will list the heat tolerant varieties of lettuce in the next post and do an experiment with some of them outside in the garden. 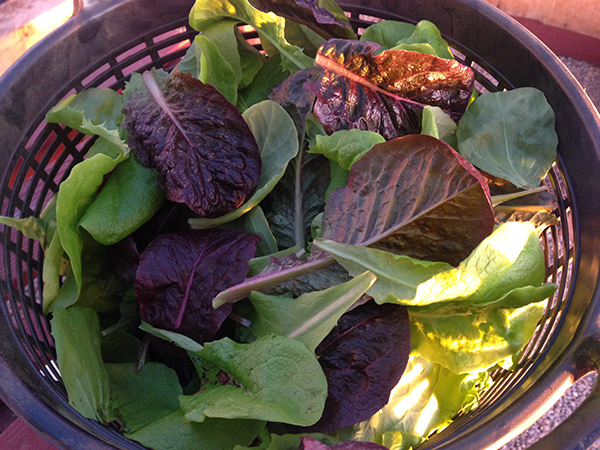 Here is some lettuce I harvested from my unheated greenhouse on January 16th! 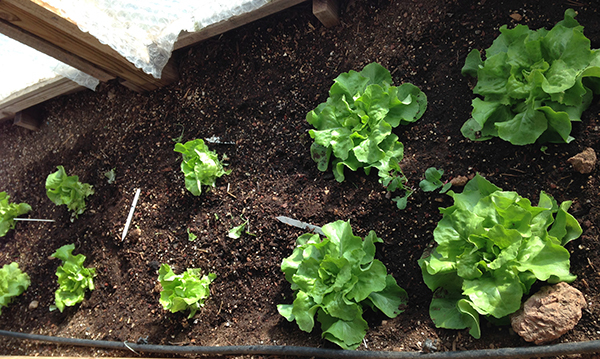 I’ve been experimenting growing some cold hardy lettuce varieties (Winter Wunder and Marshall Red Romaine) this winter. I told you I would report back and here is my first harvest. I find it amazing that they survived some very cold nights 6 to 8°F (-14 to -13°C for my European friends) in the greenhouse with only some winter weight row cover over them for added protection. I planted them from transplants instead of seeds in November so they had a good head start. It’s really fun to see something ‘green’ growing this time of year and yummy too. Well here it is in early December and not surprisingly, most of the outside crops in the main garden, ‘bit the dust’ as they say—died. A few are still alive. It is warmer now—here are the results of those cold snaps we had. 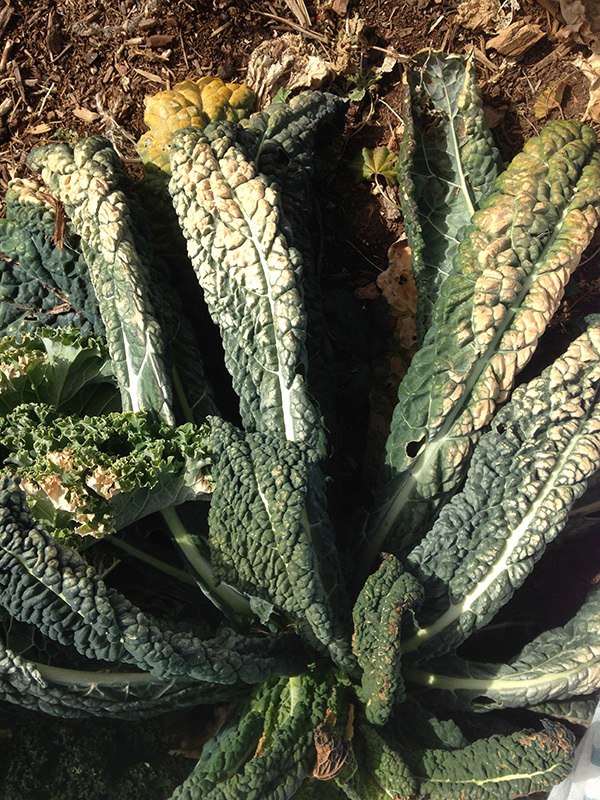 The Toscana (aka Lacinato or dinosaur) kale got severely damaged. It is cold sensitive and although it’s not completely dead, it is unharvestable. Here it is with the leaves burned from the cold. 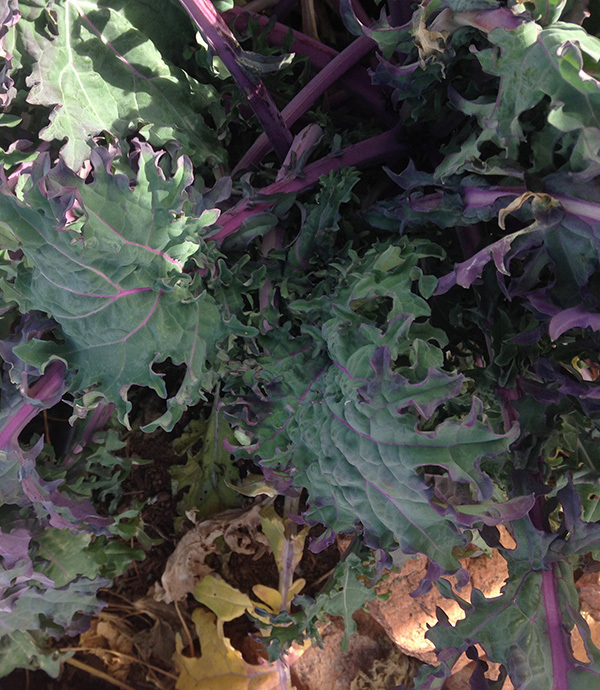 The Russian Red and Curly Leaf kale are still going and have some damage as well but the new growth is doing well. I haven’t watered them at all-nature has with a little snow and a nice rain the other day- almost an inch. I do have them covered with 2 layers of winter weight row cover. The gourds are still drying in the field. Some are starting to get lighter in weight so I will put those in the garden shed to finish drying. The rest will stay outside until they dry more. 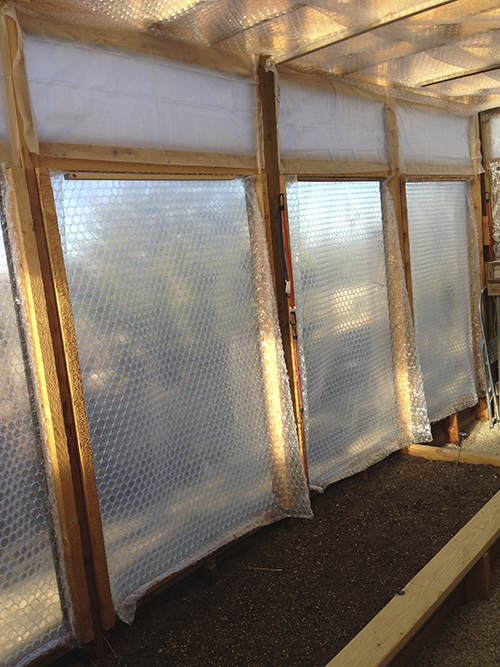 The green house is button up fairly tight now with just a little venting at the top panels. I’ve put the bubble wrap on all the windows (bubbles faced to the window) for extra insulation. I’ve also put the 4 barrels with water in them on the north wall for them to absorb heat in the daytime (I took them out during the summer), releasing the heat at night (the theory is that the sun which is lower and further to the south will hit them on the north wall and warm up in the daytime). I’m not sure I have enough barrels to do much good but even one degree will be helpful once it gets cold again. 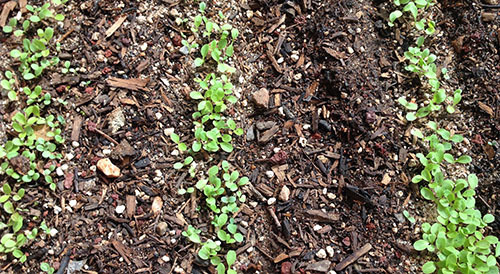 I’ve planted 2 winter lettuce varieties in the green house as transplants back in early November. The cold hard varieties are a green variety-Winter Wunder and a red variety-Marshall Red Romaine. They both have made it so far through those cold snaps although they have slowed down in growth because of the shorter daylight hours. They will stop growing until sometime in January when the daylight hours start to get longer. 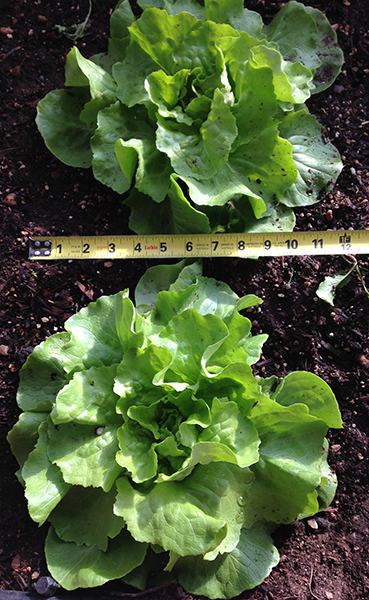 Winter Wunder is my favorite lettuce but only grows well during the cold months. When it starts to get even a little warm, it will bolt. The lettuces have 2 layers of row cover over them at night and have some protection from the unheated greenhouse (at least from the winds). I’ve also noticed that the lettuces don’t need a lot of water now (about once every 2 weeks). It will be interesting to see if they make it Dec-February. Don’t they look wonderful in the winter! There has been about a 4-7°F difference between the greenhouse temperature and the outside temperature at 7 am in the morning when I check everything. When I add the row cover at night I get about 4-6 degrees more protection. I’m not sure what to expect this winter since this is my first December-January in the greenhouse. Last year when we finished up the greenhouse I start planting on February 17th so now I will see if these established greens can survive Dec-Jan.